Cogeco Inc. ("Cogeco" or the "Corporation) (TSX:CGO) is pleased to present its new and unified brand identity, encompassing most of its subsidiaries. Unveiled at its Annual Shareholders' Meeting today, the Corporation now boasts one master brand for all its subsidiaries in Canada, the United States and Western Europe, with the exception of its American cable subsidiary, Atlantic Broadband. The launch was made in conjunction with the passing by shareholders' vote of the proposition to change the name of Cogeco's subsidiary, also a public company, from Cogeco Cable Inc. to Cogeco Communications Inc. ("Cogeco Communications") (TSX:CCA). "Having undergone a thorough review and analysis of our brand and public image, under the guidance of our senior executives and outside experts, we came to the conclusion that our brand identity as well as some of our subsidiaries' names required updating to reflect our current reality and our plans for tomorrow," stated Louis Audet, President and Chief Executive Officer of Cogeco Inc. and Cogeco Communications Inc. Just as the name Cogeco Communications better expresses the subsidiary's footprint, clearly and strongly evoking its profile and unique areas of expertise, so do the changes made to its other subsidiaries present Cogeco as strong, unified, dynamic and customer-focused. The Cogeco Inc. logo remains as the master logo for the family of companies. The symbol, with its rounded curves that further create a recognizable 'C', is more modern and friendly, making it easier for clients to connect with. However, the symbol retains a meaningful link to the company's history. "We see this new logo as an evolution of a symbol that extends back to the roots of our company," explained Mr. Audet. "While much has changed at Cogeco since those early days, the company's spirit and values have remained at the core of who we are, and sharing this symbol with the Cogeco family of companies helps remind us all of this." Cogeco Cable Inc. becomes Cogeco Communications Inc., although its Toronto Stock Exchange ticker symbol remains CCA. The Canadian cable services subsidiary, formerly Cogeco Cable Canada, becomes Cogeco Connexion. This modern name, a play on 'connections', better reflects the reality of a business that has increasingly made a name for itself in sophisticated communications services, making strong connections with its residential and business customers as well as within the communities it serves. As announced on October 19, 2015, the recently created subsidiary in Enterprise data services, which combines the strengths of Cogeco Data Services and Peer 1 Hosting, has been named Cogeco Peer 1, with a new logo that further solidifies its place within the Cogeco family while leveraging Peer 1 Hosting's strong reputation within its market. Cogeco Diffusion, Cogeco Inc.'s subsidiary in the radio sector, becomes Cogeco Media, a name clearly positioning its portfolio. An animated video presenting the evolution of Cogeco's brand through the years and illustrating the changes was presented at the Annual Shareholders' Meeting, which was held in Montréal and broadcast live via webcast on the company's website. The video can be viewed here. The Corporation will be working throughout 2016 to implement the new branding within its footprint and in all its businesses, across two continents. "It is with great enthusiasm that I embark on this evolution for our company, as we continue building, together, one strong, unified and recognizable brand, to position Cogeco for an inspiring and successful future," stated Mr. Audet. Cogeco Inc. is a diversified holding corporation which operates in the communications and media sectors. Through its Cogeco Communications Inc. subsidiary, Cogeco provides its residential and business customers with video, Internet and telephony services through its two-way broadband fibre networks. Cogeco Communications Inc. operates in Canada under the Cogeco Connexion name in Québec and Ontario, and in the United States under the Atlantic Broadband name in western Pennsylvania, south Florida, Maryland / Delaware, South Carolina and eastern Connecticut. Through Cogeco Peer 1, Cogeco Communications Inc. provides its business customers with a suite of information technology services (colocation, network connectivity, managed hosting, cloud services and managed IT services), through its 21 data centres, extensive FastFiber Network™ and more than 50 points-of-presence in North America and Europe. Through its subsidiary Cogeco Media, Cogeco owns and operates 13 radio stations across most of Québec with complementary radio formats serving a wide range of audiences as well as Cogeco News, its news agency. Cogeco's subordinate voting shares are listed on the Toronto Stock Exchange (TSX:CGO). The subordinate voting shares of Cogeco Communications Inc. are also listed on the Toronto Stock Exchange (TSX:CCA). 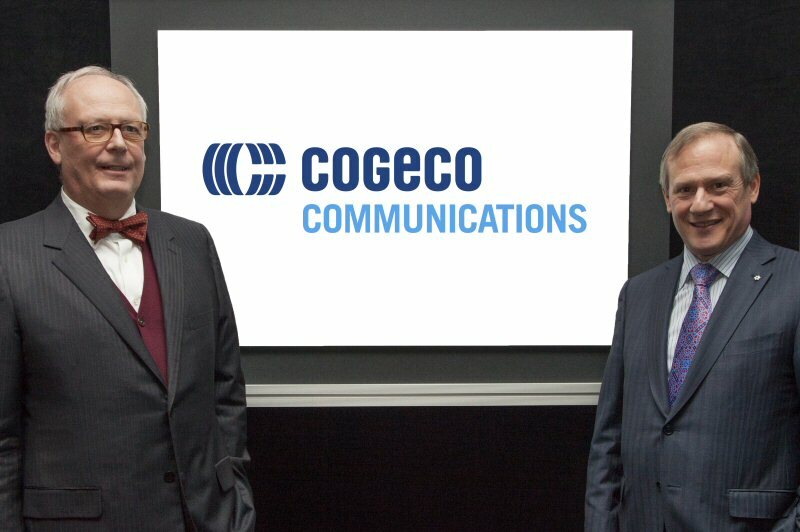 Jan Peeters and Louis Audet, Chairman of the Board and President and Chief Executive Officer of Cogeco Inc. and Cogeco Communications Inc., respectively, unveil Cogeco's new brand identity and names at the company's Annual Shareholders' Meeting held in Montréal on January 13, 2016. 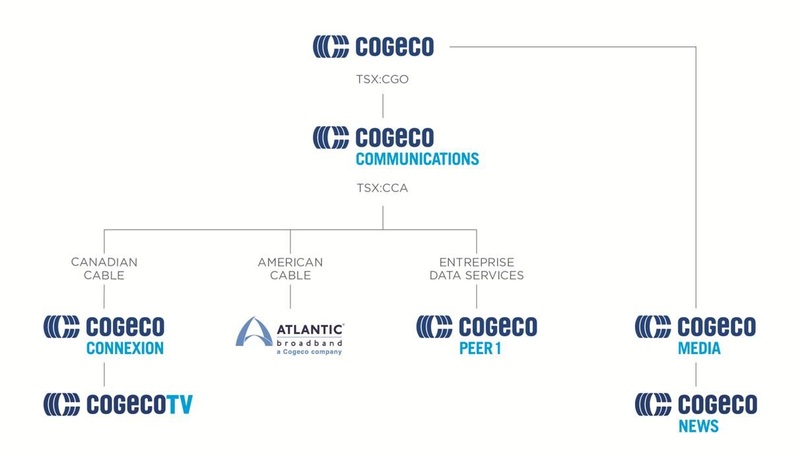 Cogeco's company structure shows one unified and recognizable brand. 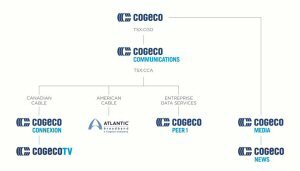 An illustration of how Cogeco's brand has evolved and changed through the years.